In recent years, women have made great strides in their search for equality. We now have many strong women in positions of power: Angela Merkel. Teressa May. Nicola Sturgeon. You may know that Norway has their female Prime Minister Erna Solberg. And of course, Hillary Clinton came close to becoming the president of the United States. There are still many women who feel that the dice are loaded against them. So, in the last few weeks we have witnessed several women's protest marches, in London and across the globe. It is evident that many women are not satisfied with the way the world is going. There is still work to do to empower women. In the world of work, women need to be empowered to feel stronger and more confident and to never hold back. 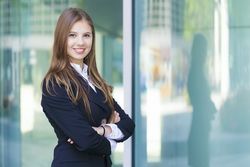 This inspiring leadership and management training course has been written especially for women. This unique course will help you to get the best from yourself and others. It is designed to pick out and remove the subtle barriers that others may try to use, to slow down your progress. This course will make you feel more empowered and motivated. On this course you will learn how to lead and manage your team with more courage, confidence and finesse. Take a look at the course description and then book your place, today. The others with whom you work. The system in which you operate. Never give up. Recognise the world works by evolution. Big changes are made up of a series of small changes combined. So, work relentlessly to challenge inequality even in small things. Challenge sexist comments, don't let them pass. If someone says to you, as I heard, once, "Let me sit opposite to Becky so I can have something nice to look at", then don't let that pass. Handle people who will try to undermine you. There are many people, both men and WOMEN, who don't like to see women with talent get on. They may strive to undermine you in ways that are obvious and in ways that are subtle. The subtle ones I call, the smiling assassin. Take on the underminers and expose them. Handle conflict in a logical, not emotional manner. In conflict situations, remain calm, logical and fact based. Handle conflict in a logical not emotional manner. Don't overtly lose your temper, or become upset or rude. Maintain your professionalism at all times. The way to the top is to outperform the others. Theresa May is prime minister because she outperformed Boris Johnson on every level. Nicola Sturgeon is the leader of the Scottish National Party because she is a highly effective speaker. This one-day training course has been designed especially for women. On this course you will learn how to lead and manage your team, with more courage, confidence and finesse; and you will feel more empowered and motivated. Find out more details about this course here and book your place, today.